For all those people who are interested in the Junior Eurovision Song Contest, here are the results and details for 2012. The 10th Junior Eurovision Song Contest took place at the HMH concert venue, Amsterdam, The Netherlands, on Saturday 1 December 2012. The contest last approx 2 hours 5 minutes. Kim-Lian van der Meij and Ewout Genemans hosted this event. 12 Countries took part. The lowest in the contest history. The 2013 host will not be the winner of the Junior 2012 contest. 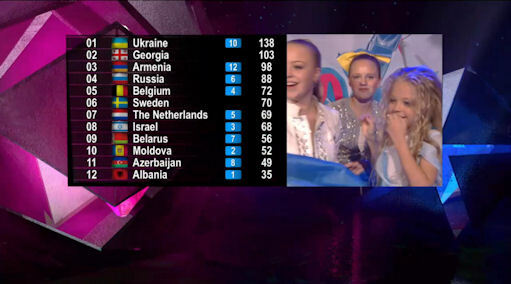 Here are the songs and artist who entered the 2012 Junior Eurovision Song Contest and their final score.